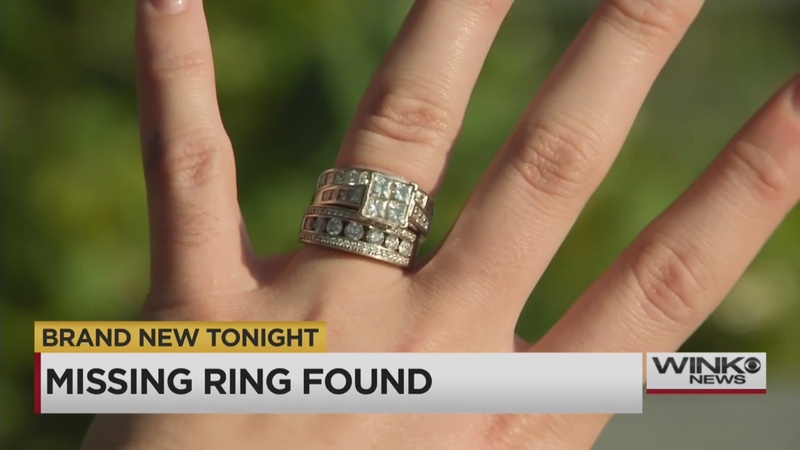 NORTH NAPLES, Fla.- A woman desperate to find her lost rings enlisted ring finders who recovered her jewelry in 15 minutes. Jessica Tayla was out in the water on Memorial Day along Wiggins Pass when her ring and band slipped off her finger. Tayla and her friends formed a line and tried to find it. They asked people on the beach for help too. Three hours of searching turned up nothing. Tayla felt “devastated, like it was definitely gone” and then storms rolled in. They all left the state park and Tayla left behind candy canes as markers and didn’t give up hope. She went home and googled “ring finders Naples” and found Craig Ostendorf and his wife. In their spare time, the Ostendorfs help people find their lost jewelry. They only charge $35 for their gas to drive to the scene. Despite the odds, it was 11:30 p.m. and lightning, the Ostendorfs walked a mile and dove in the ocean with metal detectors. Craig Ostendorf’s wife was up to her collar bone in the dark water when her detector went off. Mrs. Ostendorf found Tayla’s band and diamond ring. They were hidden 4 inches under the sand out in deep water. Both were right beside each other. Tayla paid the couple a $1,000 reward.